PRYOR, HENRY, lawyer, militia officer, politician, and magistrate; b. 3 July 1808 in Halifax, son of John Pryor and Sarah Stevens; m. there first 8 March 1831 Eliza Phoebe Pyke (d. 1858); m. there secondly 3 Feb. 1863 Charlotte McKie; there were no children; d. 10 Oct. 1892 in Halifax. Henry Pryor was orphaned at age 12 but inherited some £6,000 under the will of his father, a Halifax merchant and mha. He descended from a loyalist family which had arrived in Halifax in 1783 and become prominent through commercial success and office holding. Henry’s elder brother John would later be a founder and the first president of Acadia College, and his sister Louisa would marry future premier James William Johnston*. Henry was educated at Halifax Grammar School and King’s College, Windsor, where he received a ba in 1828, an ma two years later, and a dcl in 1858. 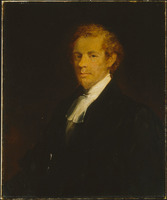 He studied law under William Blowers Bliss* and was called to the bar in 1831. 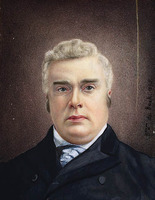 His marriage that year to Eliza Pyke, daughter of judge George Pyke* and granddaughter of police magistrate John George Pyke*, foreshadowed his own judicial career. Unlike his brother John, he remained an Anglican, involving himself in church affairs and the governance of King’s. Contemporaries thought little of Pryor’s legal talents, and he seems to have practised law in a desultory fashion. 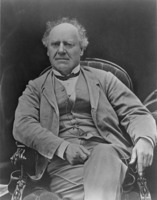 Joseph Howe* in 1842 described him as “a sly little fellow, with spectacles on,” who could be insured “for half a per cent from ever setting the world on fire.” His qc, which came only in 1873, was a dominion appointment, presumably a reward for his support of confederation. As with so many of his ambitious legal contemporaries, politics would be the vehicle for his advancement. After resisting Halifax’s incorporation in 1841, Pryor served as alderman from 1843 to 1845. His decision to seek the mayoralty following his re-election four years later was controversial. Since he was then acting as counsel to a former city official being sued by the corporation for embezzlement, the apparent conflict of interest outraged observers. Not until a week after he was sworn in as mayor did he retire from the case. This episode, in addition to allegations of vote buying when he next stood for mayor, suggests that there were grounds for Howe’s lack of trust. Pryor was successful in 1853 and 1854, but in 1855 he was narrowly defeated. 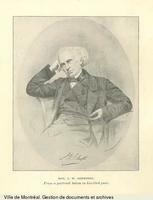 Chastened, he retired the next year, only to win handily in 1857; in 1858 he won the chair by acclamation. Although never a popular mayor, he seems finally to have earned a certain grudging respect from Haligonians. Next Pryor graduated to provincial politics. Elected to the House of Assembly as a Conservative member for the western division of Halifax County in May 1859, he won a second term, which ended in 1867. His contribution to legislative affairs was modest, though some felt he was unfairly passed over for solicitor general when John William Ritchie* was named to the office in 1864. Pryor had entered the militia in 1827 as a lieutenant in the 2nd Regiment of Halifax militia and rose to lieutenant-colonel. He drilled his regiment on the Halifax Commons in preparation for the anticipated Fenian invasion of 1866. In later years he was in command of the reserve militia in Halifax. By 1867 Pryor faced a rather bleak prospect. He was nearing 60, and much of his capital seems to have been lost in unwise speculations. Thus he began a search for financial security in the form of a judicial post. A bill to provide for Halifax’s first stipendiary magistrate had been defeated in 1864, denounced in the Presbyterian Witness as “an arrangement by which Henry Pryor could be snugly provided with £500 a year.” Three years later the legislation met with success, and Pryor was appointed on 15 May 1867. The stipendiary magistrate inherited the civil and criminal jurisdictions that had been vested in the mayor and aldermen by the Halifax charter. The civil side of Pryor’s authority, covering mainly small debts, occupied only a few days a month. The criminal side demanded his presence six days a week year-round. He was thus brought into intimate contact for nearly twenty years with the under-side – and under class – of Victorian Halifax. Drunks, prostitutes, and vagrants, many of them recidivists, were his daily companions. Family disputes were often before him, as were prosecutions for violations of the liquor licensing laws. After one such successful prosecution in 1884 Pryor received a death threat. He treated all these offenders with an unpredictable mixture of severity and mercy. Untroubled by the finer points of precedent, procedure, or statute-book, he tailored the punishment, or lack of it, to fit the person not the crime. For this he was increasingly castigated in the newspapers, which portrayed him as arbitrary, unprofessional, and irascible. His clientele, however, probably perceived a certain moral economy to his decision making. His essential legitimacy in their eyes is demonstrated by their continued recourse to him for the settlement of personal and familial disputes. In 1886 Pryor opted to retire upon provision of an annual pension of $1, 200. (He was succeeded by Robert Motton.) His salary, set at $2,000 in 1867, had never been raised. The tributes upon his retirement were perfunctory. Pryor was something of an embarrassment, an ultra tory at odds with an age of progressive reform, a dispenser of cadi justice in an era of enhanced legal professionalism. Kinship and, initially at least, wealth ensured a place for him in provincial society far beyond that which his talents might have merited. Halifax County Court of Probate (Halifax), Estate papers, nos.4326, 5133; P92. PANS, RG 42, HX, D, 26–29, 31. N.S., Statutes, 1841, c.55; 1865, c.87; 1867, c.82; 1870, c.7; 1886, c.63. Acadian Recorder, 8, 21 July, 18, 20 Dec. 1879; 14–15, 19 May 1886; 11 Oct. 1892. Halifax Herald, 11 Oct. 1892. Morning Herald (Halifax), 9 June 1884. Novascotian, 8 July 1842; 15, 22 Oct. 1849; 17 Oct. 1853; 6 Oct. 1857. Presbyterian Witness, and Evangelical Advocate, 23 April 1864. Canadian biog. dict. Judith Fingard, “Jailbirds in mid-Victorian Halifax,” Law in a colonial society: the Nova Scotia experience, ed. P. [B.] Waite et al. (Toronto, 1984), 81–102. F. W. Vroom, King’s College: a chronicle, 1789–1939; collections and recollections (Halifax, 1941). Philip Girard, “PRYOR, HENRY,” in Dictionary of Canadian Biography, vol. 12, University of Toronto/Université Laval, 2003–, accessed April 24, 2019, http://www.biographi.ca/en/bio/pryor_henry_12E.html.